Why move Caspian flotilla to Middle Eastern theater? Caspian flotilla will be relocated from Astrakhan to the town of Kaspiysk, Dagestan, Russian Defense Minister Sergey Shoigu said earlier this week. He said that vast construction work will be conducted in Kaspiysk, including building of quays, logistic facilities and housing. As well, the number of the flotilla’s personnel will be increased. 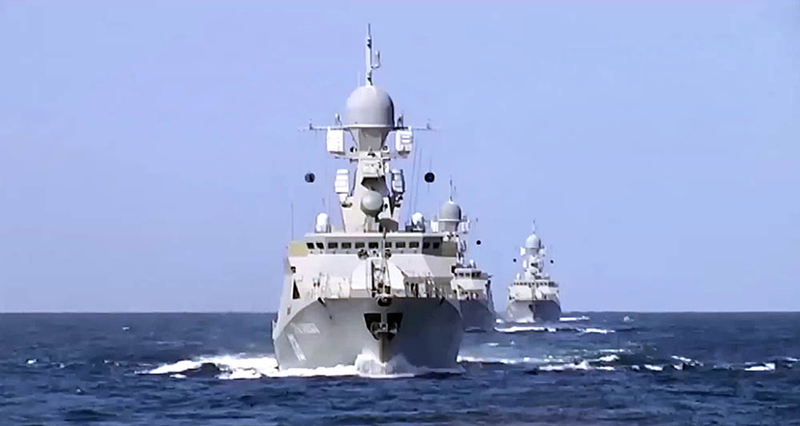 The Russian Caspian flotilla is the largest and most powerful naval unit in the Caspian Sea. None of the Caspian littoral states has such a number of warships with modern on-board weaponry as Russia does. All of the states have have good relations with Russia, so Russia’s rivalry with coastal countries is not the reason. The Caspian Sea is an enclosed body of water, so a possible clash with warships of third parties may also be excluded. Also, the transfer of the naval base from Astrakhan to Kaspiysk is quite costly. Then why has the decision been made? Let's take a look at some possible reasons. According to Russian sources, in recent years, the Volga River is growing shallower in its course, which makes it complicated for warships with deep draught and heavy-weight weapons to maneuver in the Astrakhan water area. Also, in winter the Volga Delta and the Northern part of the Caspian Sea often freeze over. The flotilla warships are of not reinforced ice class, and in a severe frost they risk to be icebound on the base. Growing tensions in the Middle East can one day lead to armed clashes or full-scale war, which is harmful for Russia's national interests. So Russia is taking preventive measures, if it happens. The flotilla will be relocated closer to the Middle East theater of operation strengthening Russia’s striking capacity from the North and winning time for deployment. Suppose that the flotilla is tasked to move from its permanent location to the Iranian territorial waters to launch the “Kalibr” missile complex, with which its warships are equipped, for eliminating assigned targets somewhere in the Middle East, precisely as it was done in October 2015 against the IS strongholds in Syria. Astrakhan is about 100 km from the Caspian Sea and ships need to pass the Volga Delta to enter the open sea. "Astrakhan is 100 km away from the Caspian Sea. What kind of a naval base it is, if takes six hours to go down the river?," Admiral Igor Kasatonov, the advisor to the Chief of General Staff recently told RBC. The frigate-type guard ship “Dagestan” – the flagship of the Caspian flotilla – can reach a speed up to 28 knots, which is about 52 km per hour. The distance from Astrakhan to the town of Kaspiysk is about 400 km. The remaining 300 km to Kaspiysk vessels, going at maximum speed, will cut for another 6 hours at best. Thus, relocation to the new naval base can save valuable 12 hours for the flotilla to reach the designated area and be operational. Stability in the North Caucasus is of critical importance to Russia. The painful and implacable process of fighting corruption has recently begun in Dagestan, which has almost degraded the region's economy in recent years. The process is accompanied by detention of many high-level officials charged with corruption schemes and embezzlement of budget allocations. Given the strong clan ties and the fact that the region is home to more than 30 nationalities, Dagestan, like the entire North Caucasus, is likely the most sensitive region of Russia. This is well known not only to the Russian leadership, but also to its political foes. Any serious incident there on any ground can turn into a big problem. Therefore, the presence of the naval base will be an additional stabilizing factor, not only with regards to the ongoing developments in Dagestan, but in general. Some military experts consider this reason to be totally groundless, where some others say it makes sense. The Dred Scott of Climate Change?